16 hours. 369km. 2000 kyat ($2.00 in 2014) – Traveling by train from Dawei to Mawlamyine certainly isn’t fast but it’s fascinating dirt cheap. All aboard the slowest train in Myanmar! Dawei has 2 train stations. The Dawei > Ye > Mawlamyine service leaves from Sagaing station at 5:40am and from Dawei’s main station at 6:10am. This nice man at Dawei train station helped me buy a ticket! This service continues to Kyaikto, Bago and Yangon (arrival 06:20). Here at DIY Travel HQ my train departed on time but arrived 1.45hrs late – not too bad for the slowest train in Myanmar! The train departing Dawei ends at Ye, where there is a break of around 15mins. You must change trains to Mawlamyine (simply hop from one to the other). I didn’t purchase a ticket in advance, and onboard the conductor let me travel for free. However, when we arrived at Ye, he escorted me to the ticket office to buy a ticket to Mawlamyine – upper class, roughly 2,000 kyat / $2.00. We also recommend Lonely Planet’s Myanmar Travel Guide to help you plan your trip. Despite my insistence, everyone on the platform insisted that I could not travel in ordinary class – no explanations, the precious foreigner must go upper class. The Myanmar train ticket inspector checked a monk’s ticket but did not let me pay… foreigner above one of Buddha’s own? The ticket inspector asked a monk for his ticket but not me?! Perhaps the paying monk was an exception as 2 other monks who later boarded weren’t checked for tickets or payment. Also, on the packed train, no-one sat next to him, unlike the 2 other monks who boarded and disembarked at different times, and sat with commoners. While monks may not always ride for free, they always get a seat, usually the best or front ones. A passenger moved to let me have the good window seat at the back – thus also keeping the foreigner at a distance from the locals. In upper class, there were quite comfortable seats in various stages of inadjustable recline. My good window seat in upper class – special foreigner privileges! Once on board, one is immediately struck by an intensity that, at an early post-sunrise hour, quickly awakens the senses. The tranquility of the passing lush green landscape literally collides with the loud, rickety rocking of the slow-rumbling Myanmar train, with branches and leaves brushing against the train and spilling into the windows. Yet, the train doesn’t awaken, crawling along on narrow-gauge tracks, making up for in noise what it lacks in speed. Gradually at first, then picking up the pace, the train comes to life over the 8 hour journey – not with mechanical acceleration but human traffic. There was so much to savour on the slowest train in Myanmar and it was one of my top experiences in Myanmar. At every stop, space and legroom is replaced by more and more passengers, with their accompanying baggage, goods and children. Chitchats and chinwags add to the clamor and clatter of the commotion, charging the carriage with an all-encompassing corporal consciousness. The verdant scenery outside largely paralleled the interminable rocking of the train: grassy, leafy, countrified; bushes, trees, shrubs, plants – the greenery unpunctuated by flowers or fruit. Instead this natural monotony intersects with regular stops and the corresponding animation of the slowest train in Myanmar. More passengers waiting to board Myanmar’s slowest train! Wave back at all the kids from your window! The 2nd train, from Ye to Mawlamyine, was much more civilized – once more, in upper class. The precious foreigner got seat 1A and there was no-one on the floor… except for monks. Again, train hierarchy confuses, as the behavior of its most holy passengers enlightens. Observed monks were on smartphones and notebooks, bartering for wallets and watches with onboard hawkers and carrying radios playing strange noises, neither songs nor chants. The changing landscape of these back to back trains was as stark as it can sometimes be when border crossing between countries. Fertile green vegetation crosses onto swampy marshland, with water in the foreground against a backdrop of clear open fields, swaying palms and village settlements. Girls and boys, men and women, all were hanging around, on and off the tracks. Nightfall brought with it falling bugs, as stars appeared, brighter and shinier as the sky turned darker, until all that was visible were the scattered golden tops of stupas near and far, albeit the trackside homes lit by candlelight or, occasionally, minimal power. Amidst it all, the shaking and noise of the train did not ease, just enhanced by the fissures of lightning. The humidity, too, was inescapable. Day to night, this Myanmar train journey was a wonderful experience. From the early morning chill, to the heat of the day and the slightly cool night breeze, a broad stretch of Myanmar was covered – geographically and socially. While grievances over this often-maligned government-run service are justified, the journey was unforgettable, with one valuable Myanmar travel lesson learnt – never take a night train! 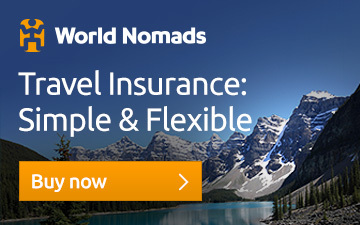 * Don’t forget to purchase travel insurance before any trip to Myanmar. We’ve been using World Nomads for over 10 years. It’s the best-value provider we’ve found but there are other important things to consider. Check out our post and find out which of our claims were successful or denied. No need to go hungry with meals like this you can buy from the vendors through the window! Did you enjoy reading The Slowest Train in Myanmar: Dawei to Mawlamyine? What’s your favourite Myanmar train journey? Nice, Myanmar is such a beautiful country! I didn’t take that train myself.. but looks like a very nice experience! Thanks Miguel, it was a very long trip but I’m still remembering it now with a smile 🙂 Cheers!